Massachusetts toll classes, payments and fines. Any driver that uses a toll road in Massachusetts is expected to pay the toll for that roadway. Tolls are set by the Massachusetts Department Of Transportation, known as "Mass DOT". If you have an E-ZPass violation notice from Massachusetts, and your vehicle is also registered in Massachusetts, you may call 877-627-7745, and select Option 6, to resolve your violation. Otherwise, please contact the MassDOT Violations Processing System via on of the channels below. If you have a been issued a ticket for a toll violation or traffic safety issue, it may take up to 14 days for the ticket to be available for online or telephone payment. Whether you pay online or via telephone, be aware the payment system is not available between Midnight and 2:30 a.m.
To pay your ticket by telephone, call 866-740-3467. 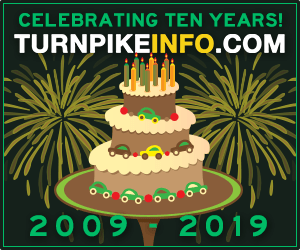 Massachusetts does not accept cash on its toll roads, becoming one of the first states to adopt, completely, an all-electronic tolling system for its turnpikes and bridges. Essentially, you have the option of simply driving the toll roads and bridges, and each month you will receive an invoice for each vehicle, at the address that corresponds to your vehicle registration. This method is called Pay-By-Plate. You may also set up an E-ZPass account, if you do not already have one. Pay-By-Plate is also called Toll-By-Plate or, in the broad vernacular, open-road tolling. There are no toll booths with open-road tolling, as overhead gantries use equipment to photograph each vehicle that passes. Sensors overhead and in the roadway, itself, detect the number of axles on a vehicle. Using the photographs of your vehicle's license plate, along with the sensor data, the correct toll charge can be levied. 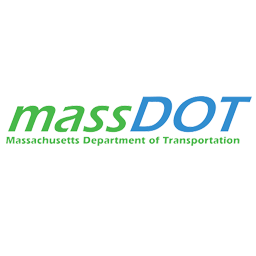 The first time you drive any toll road or bridge in Massachusetts, a Pay-By-Plate account will be automatically created by the Masschusetts Department of Transportation. An invoice for your very first trip will be generated and mailed to the address that is listed on the vehicle registration. For all subsequent trips with said vehicle, the cumulative toll amount, for the specified vehicle, will be sent in a monthly invoice. You have the option to open your own account with Mass DOT, or you can simply pay your invoices online. Massachusetts is on the E-ZPass electronic toll collection network, so any transponder that displays the E-ZPass or IPass logo will be accepted in Massachusetts. If you have an E-ZPass from a state other than Massachusetts, or an IPass from Illinois, you may use the E-ZPass lanes. However, to qualify for any E-ZPass discounts, you must use the Massachusetts E-ZPass. Non-Massachusetts E-ZPass holders will pay the cashless tolling rate. The funds will be deducted from your E-ZPass account. 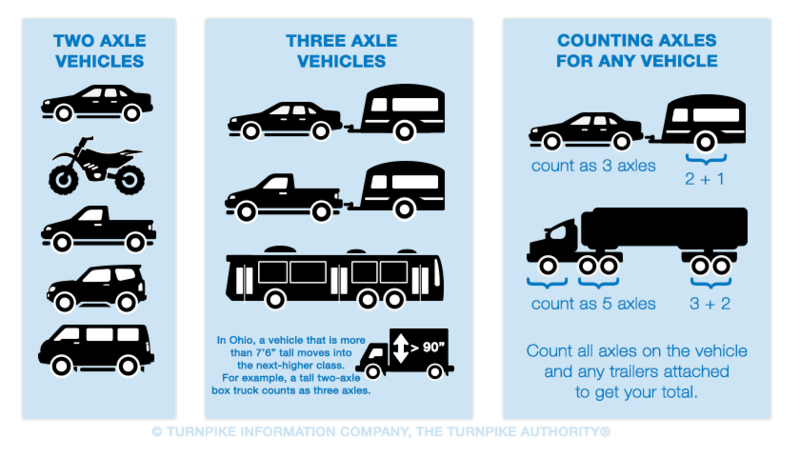 This graphic provides general information about how to count the number of axles on your vehicle. See the information below for detailed information for Massachusetts. The classification system is simple in Massachusetts. Tolls are calculated based on the number of axles your vehicle has. Any trailers that are towed behind your vehicle will also have the axles counted, so when you count the axles on your vehicle, be certain to add the number of axles on the vehicle and the trailer to get your total. Additionally, there are dual-tire and commercial variations of these classes. For instance, if you are driving a two-axle commercial vehicle, that will be a different price point than the standard 2-Axle rate. Vehicles with dual-tire rear axles are also charged at a different rate.